Charlie Mars has been a journeyman artist with major label releases and high profile gigs opening for the likes of REM, KT Tunstall, Citizen Cope, Steve Earle, among others. The Mississippi-based troubadour builds upon the distinctive musical approach first mined on his 2009 breakthrough Like A Bird, Like A Plane, employing supple grooves and delving deep within to offer insight and a path to self-awareness and ultimately transcendence via a gracefully beatific distillation of folk, rock, and smooth acoustic soul. He doggedly developed a sonic style uniquely his own, a sound informed less by traditional rock than by sinewy and soulful rhythms that seemed to bubble up from within his soul. With its sparse instrumentation and focus on transcendent grooves and ambient space, his minimalist approach to music ads maximum intensity to Mars’ already powerful songwriting. 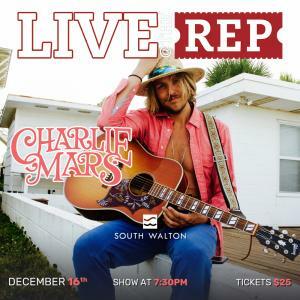 Mars will be in town performing songs from his Emerald Coast inspired album “Beach Town”.